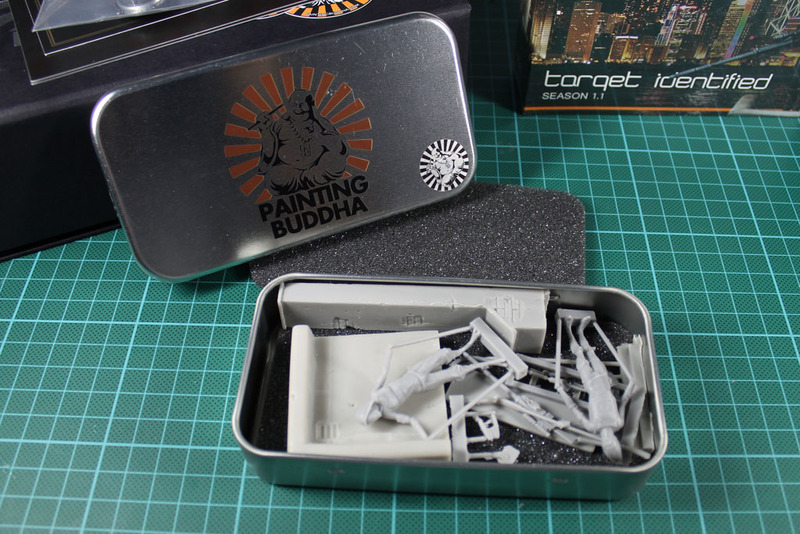 Painting Buddha starts up the next Volumes of their painting tutorials and for me it is about time, to show you the first Volume, “Target Identified”. 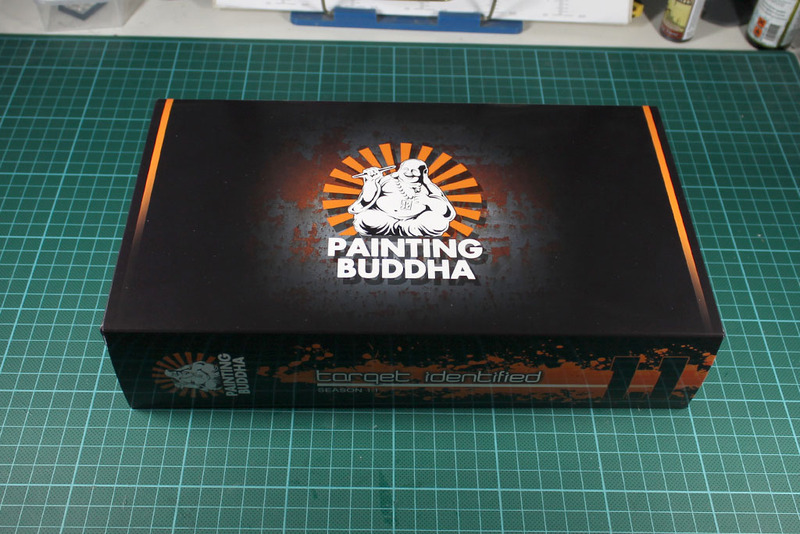 A solid banderole sorrounds the dull black cardboard box with embossed Painting Buddha Logo. Just lift the lid and you see the voluptous content. 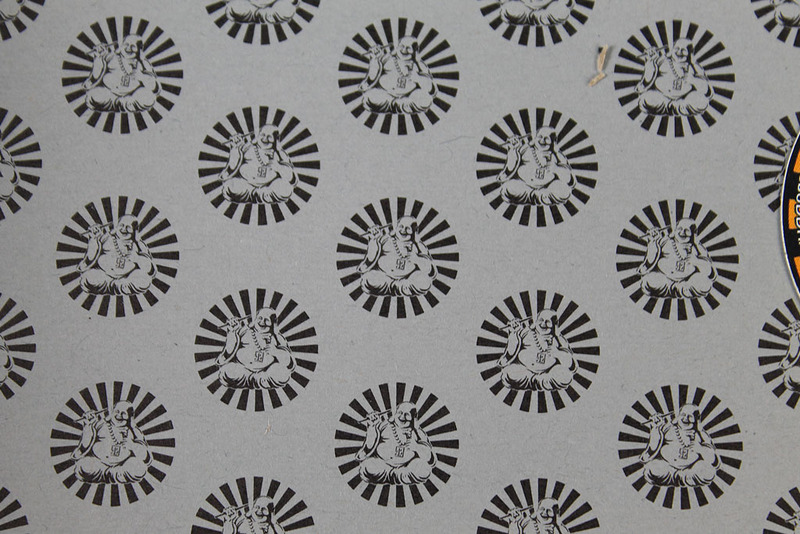 The inner lining of the box is medium gray and lots of logos. 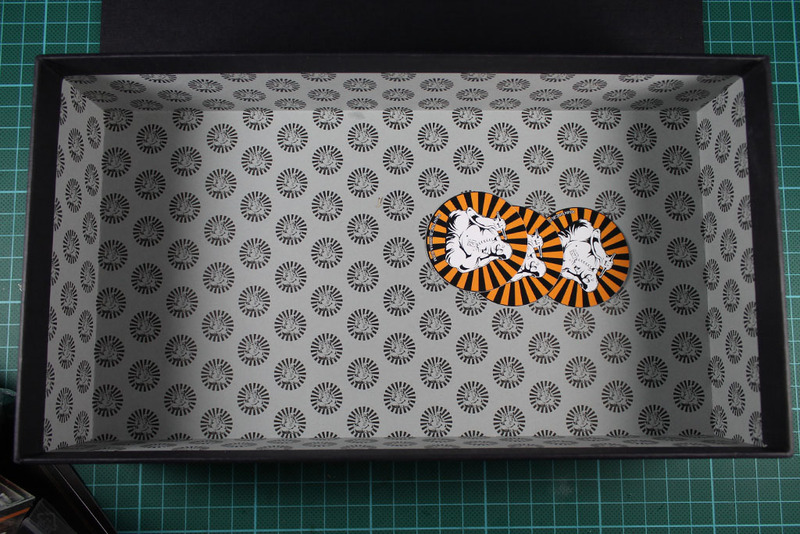 The box is sealed with the 2 stickers, each of them with a 21mm diamater. Wait, two times 21 is 42. 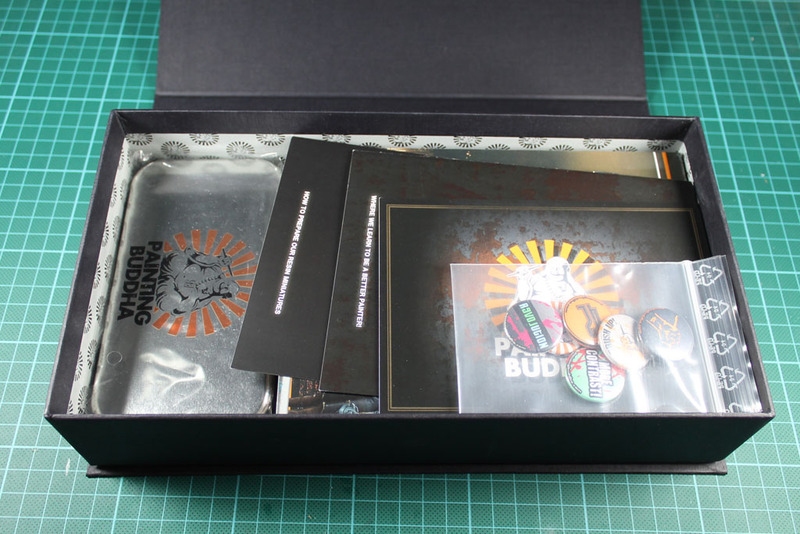 Inside the box you will find the DVD set, two booklets, a zipbag with pins, a few sticker and a small metal jewlery box. 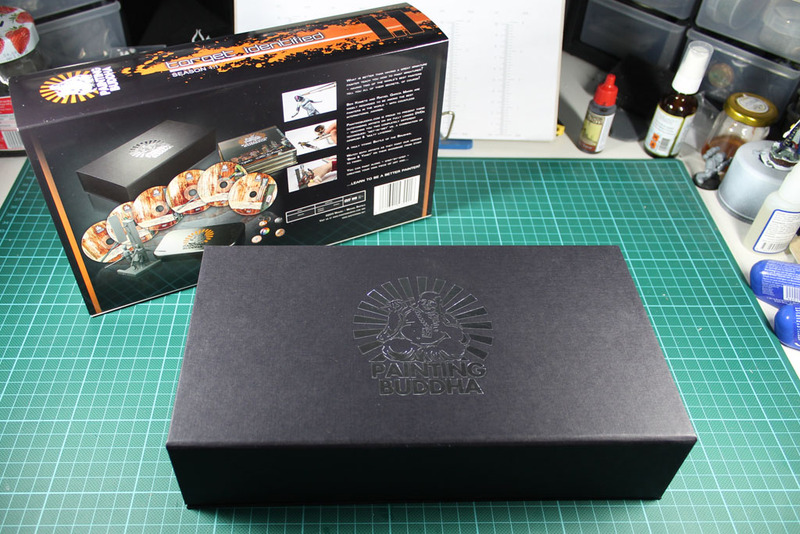 The jewlery box contains two resin miniatures along with a sculpted base. 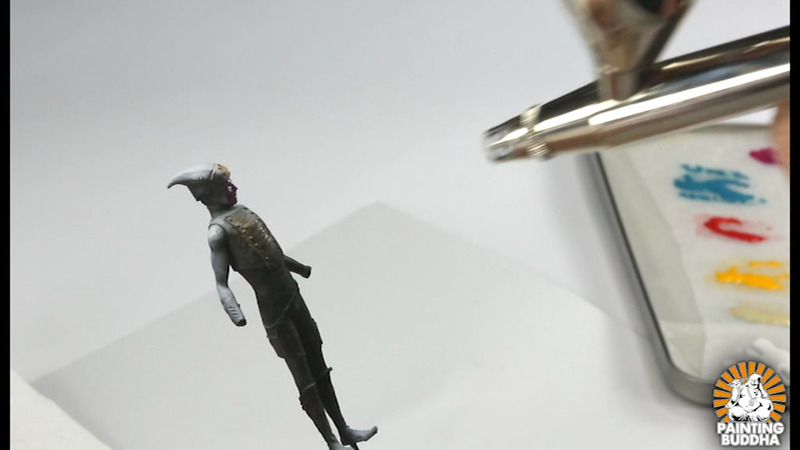 The miniatures are kept in 54mm scale, a usual scale for showcase figurines. 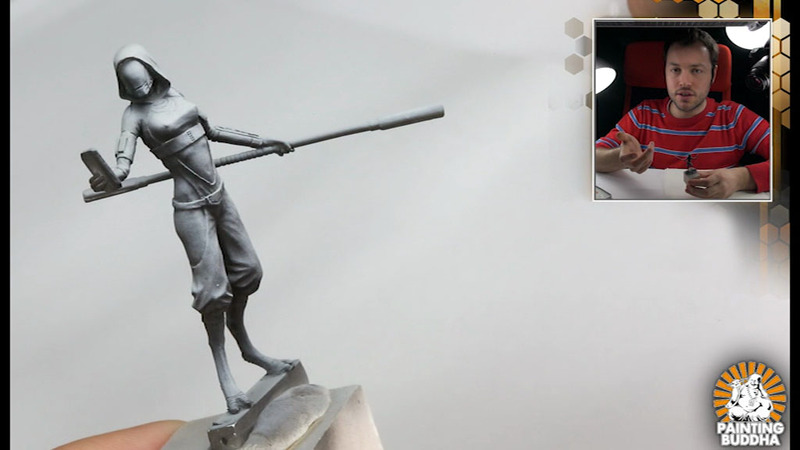 The casting is top notch, without bubbles and minimal flash. They are kept in a lean and tall way and very detailled. There are six dvds in total, fully loaded with moving pictures. 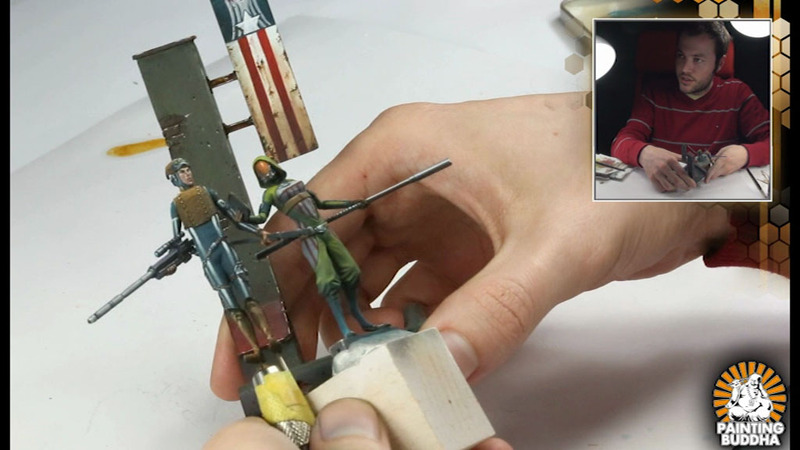 On these dvds, Ben "White Rabbit" Komets and Rafael “Volomir” Garciá Marín show their skills on both miniatures, Brad and Yannet. Ben Komets is a german artist, who participated very successfull in several Golden Demons (and may call himself winner of a total of 3 Slayerswords) and paints among others for BaneLegions. Rafael Garciá Marín, a.k.a. 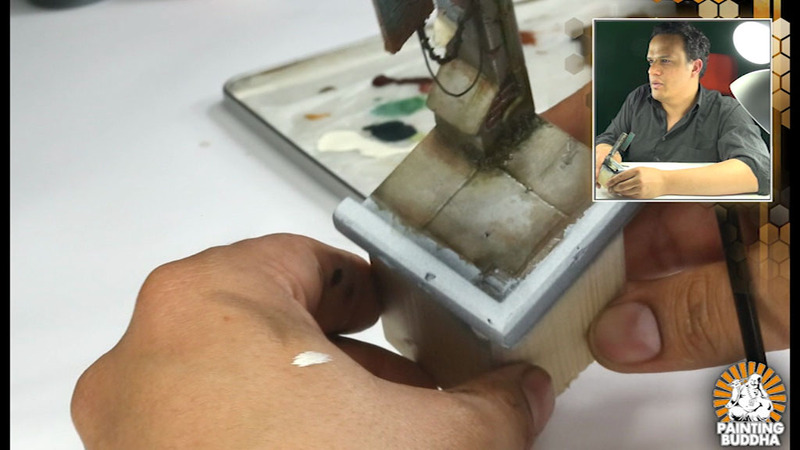 Volomir, is a very talented spanish painter, who offers workshops and hosts a very active painting blog, with lots of articles, tutorials and event coverage. 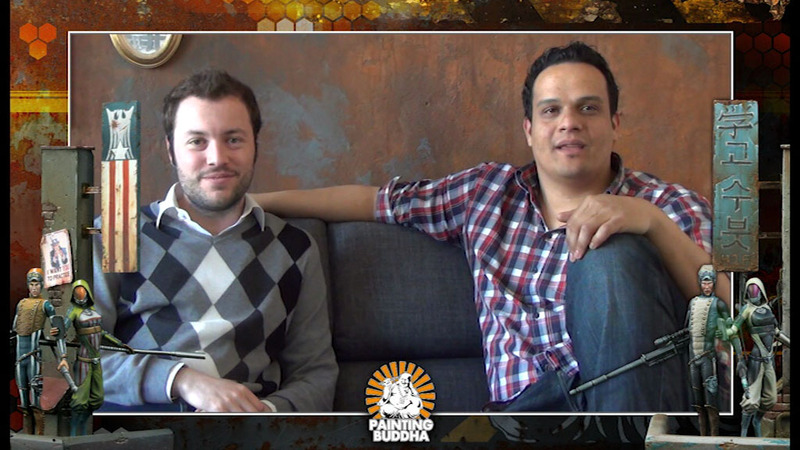 The audio tracks are in english, the subtitles are available in english, german and spanish. 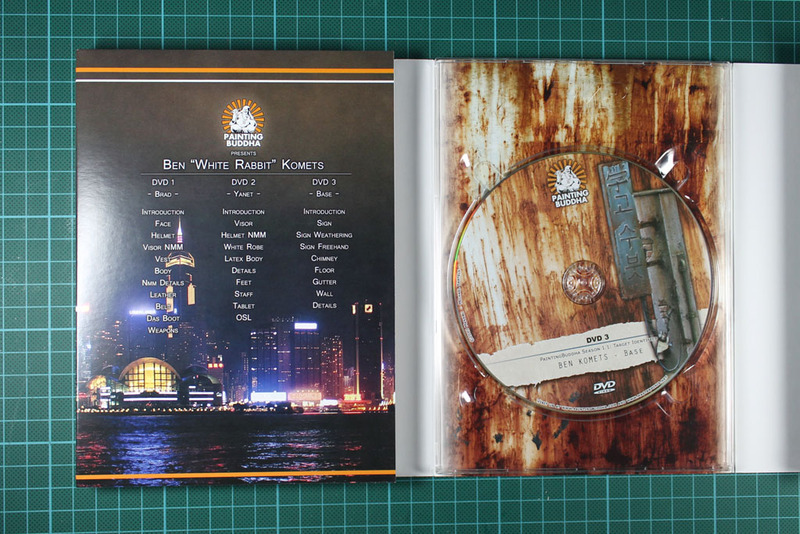 Each dvd covers one of the major topics, #1 and #4 with Brad, #2 and 5 with Jannet and #3 + 6 with the bases. 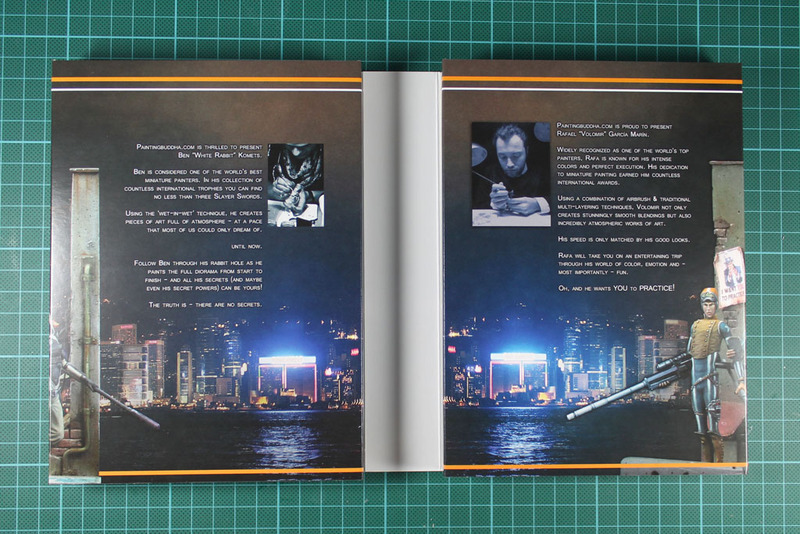 The last dvd covers bonus material like shootouts, an interview and the credits. 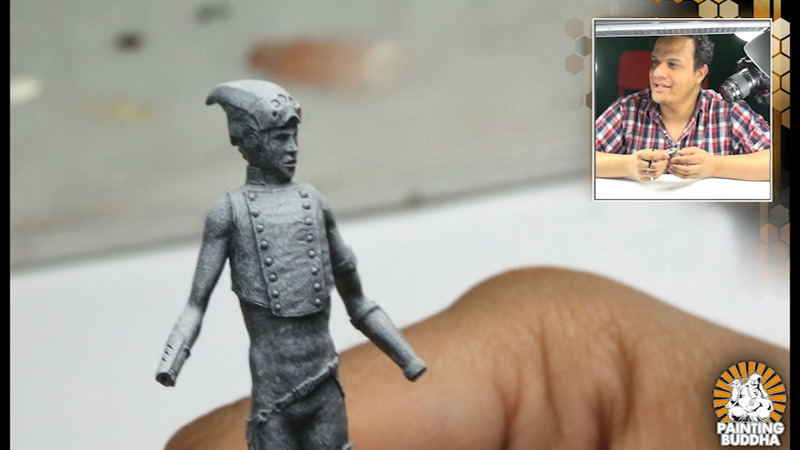 Beginning with Ben Komets and the miniatur Brad the dvd impresses with crisp and sharp quality of image. 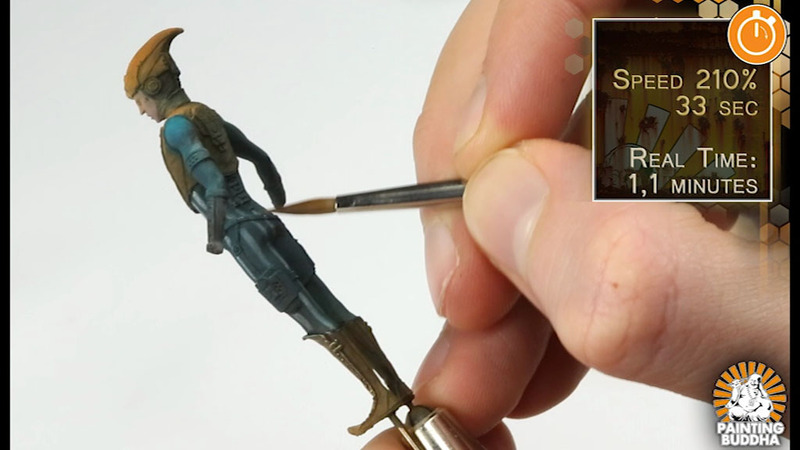 Ben covers the basics and preparation, explains the priming and all of his steps are easy to comprehend. 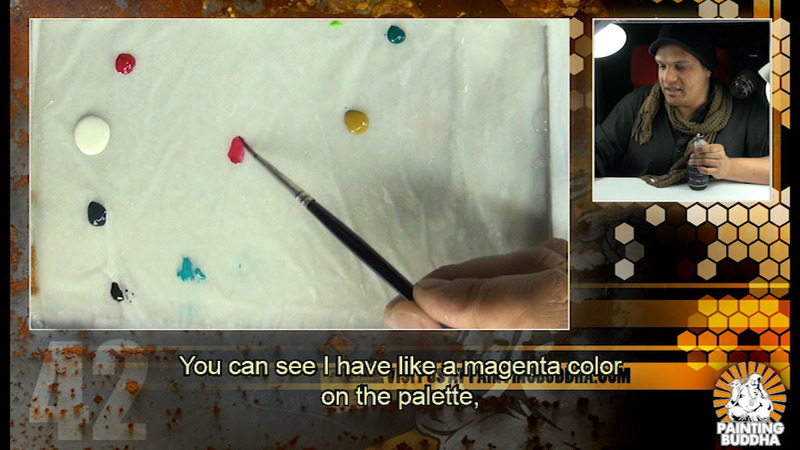 Impressive and interesting are the picture-in-picture shots, where you see the painter as well as his POV. 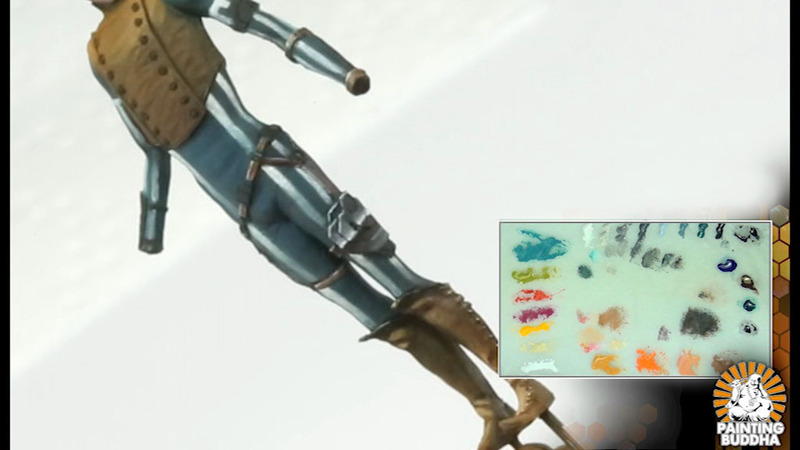 Complemented with technical explanations / fade-ins, like the wet-palette, you get the full package. 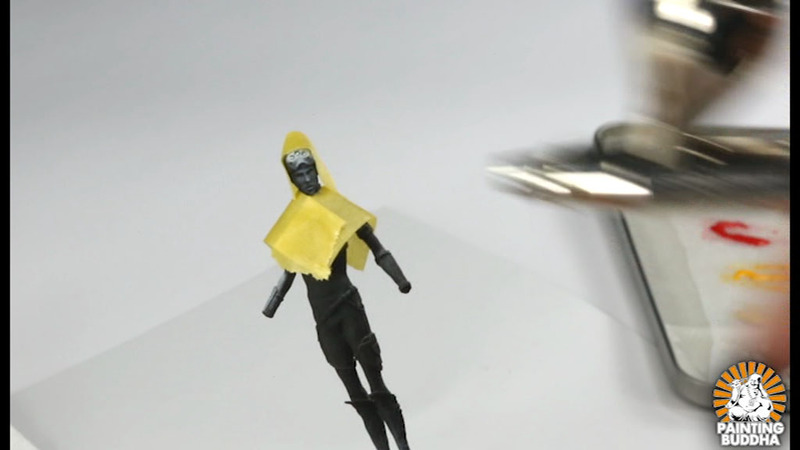 Especially because the wet-palette is Bens special talent. 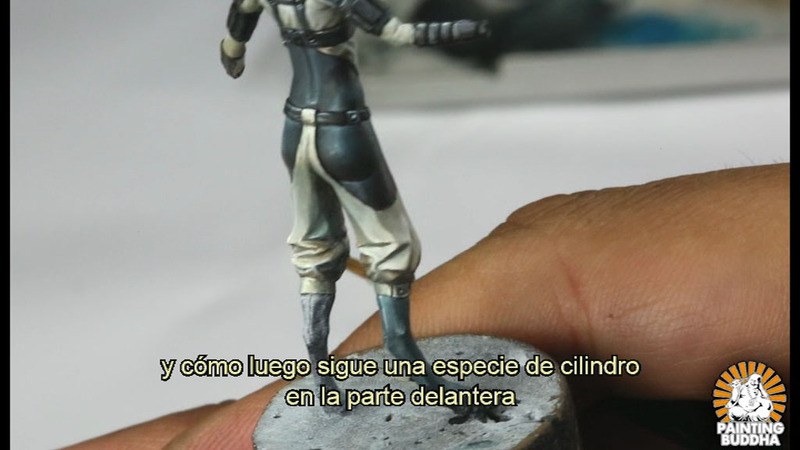 The next dvd is dedicated to the second miniature, Yannet. Again you will find the picture-in-picture shots, which both painters use. 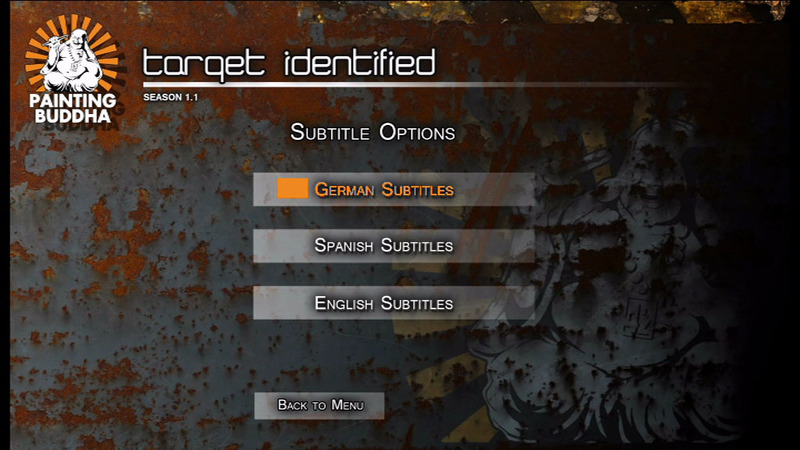 The screenshots show you the subtitles in german and spanish as well. 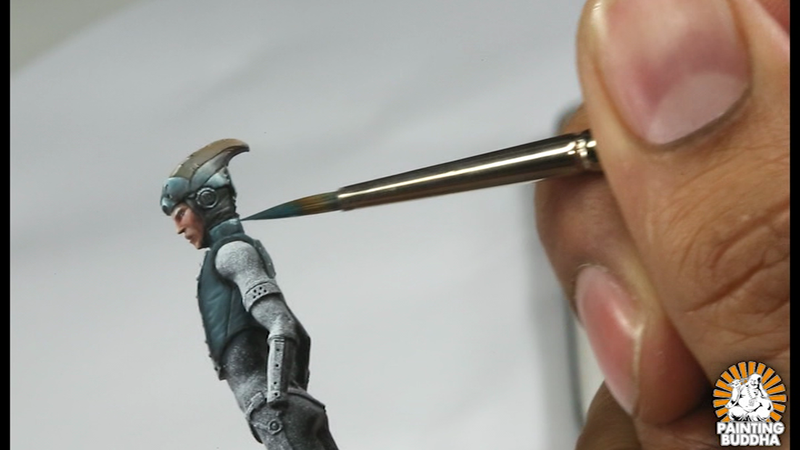 The wet-blending on the helmet and pants are just impressive. 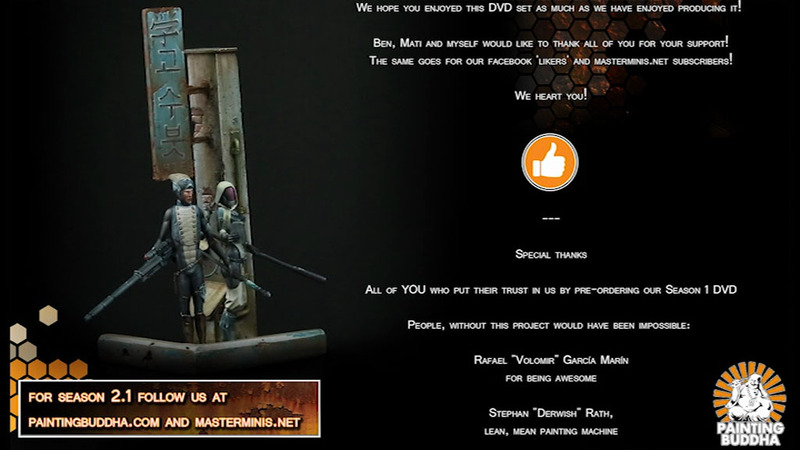 To complete the whole project, the dvds cover the painting of the bases as well. 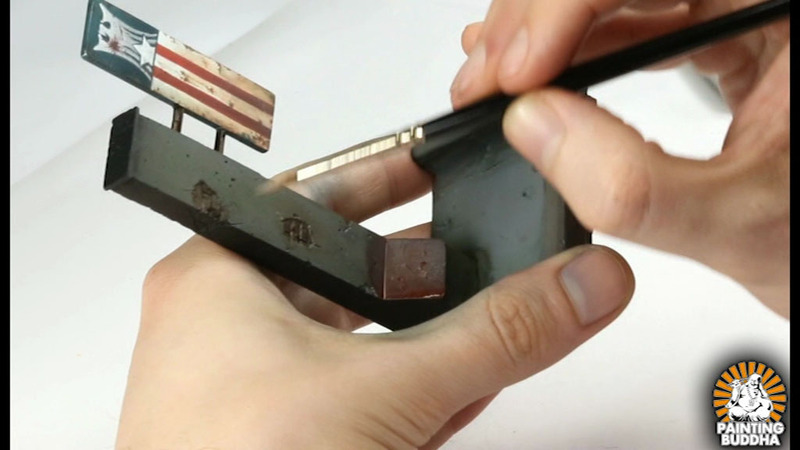 The gradient shown in picture and sound, the used techniques are so much closer and easier to understand as a video, compared to the many tutorials you will find online. On dvd 4 Rafael takes the helm. 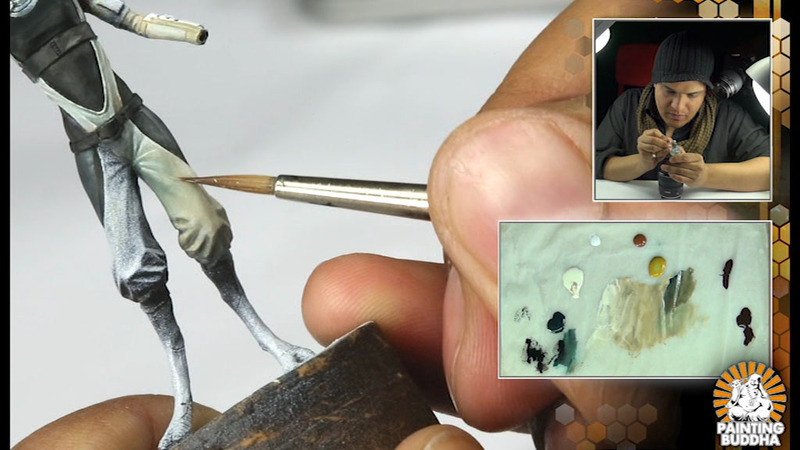 As Ben has his focus on the wet-palette, which is although used by Rafael, he shows you his skills with an airbrush. If you should have a problem with the slightly spanish accent, just load up the subtitles. 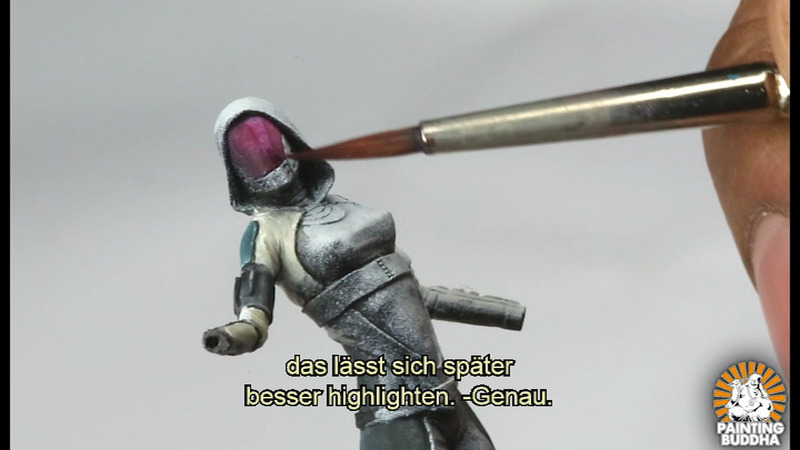 The airbrush technique is thanks to the video easy to comprehend and the partly covered miniature gets a special treatment with the brush. Several thin layers build up more details. 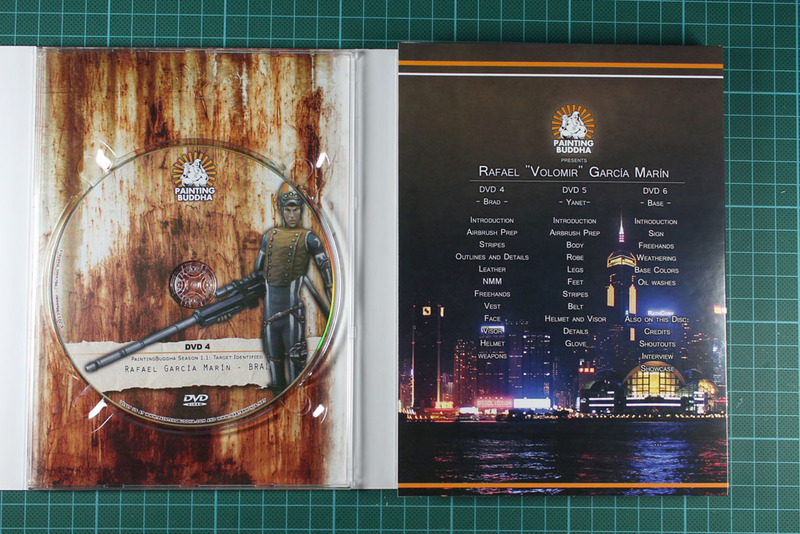 Of course, Rafael covers in his part of the dvds the base as well. 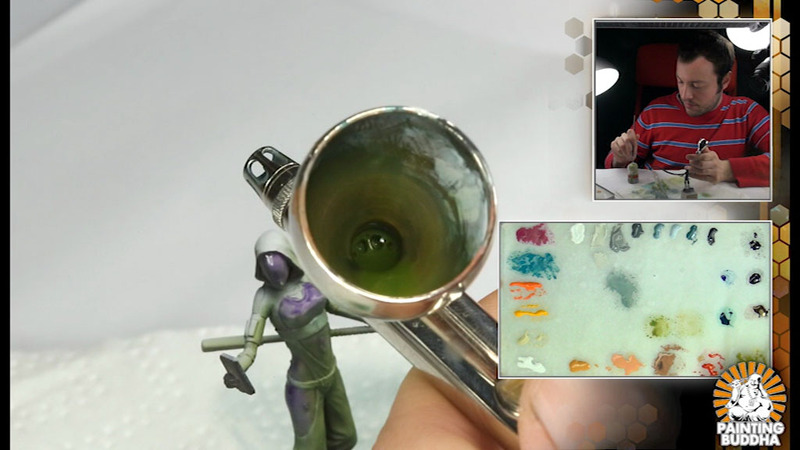 He uses oil colours and explains why and how to do so. 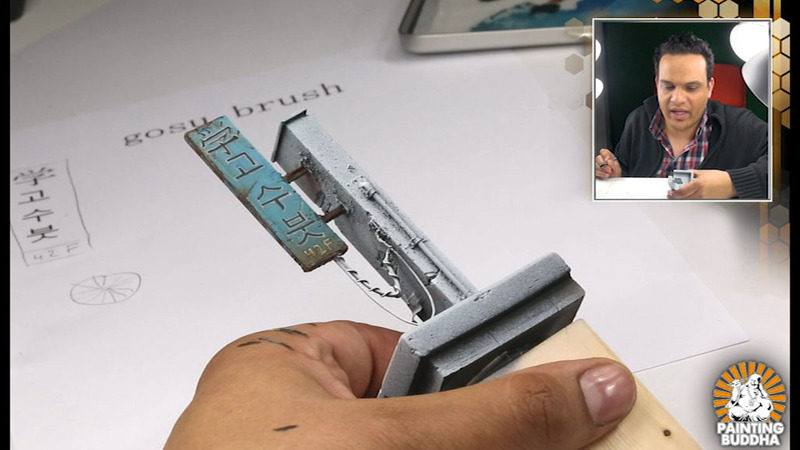 And interesting addition is the transfer of the pencil sketch to the brush painted design. 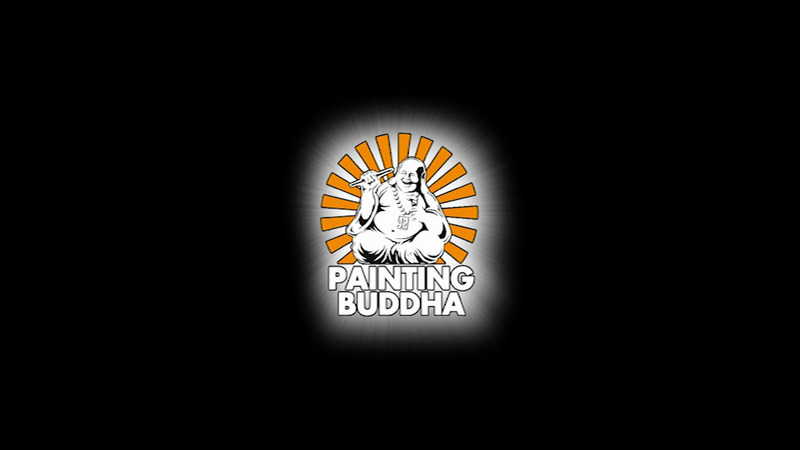 For the last chapter, Michael Bartels, the bearded man behind the Painting Buddha project, gets both painters in front of the camera again. 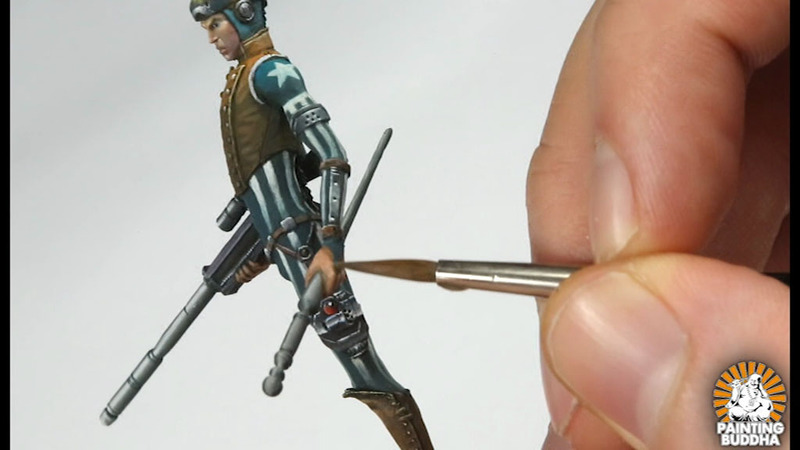 They use the time to give some comments about the project, the techniques and the miniatures. The credits are loaded with small jokes and Eastereggs (Arrr! Pirates!) 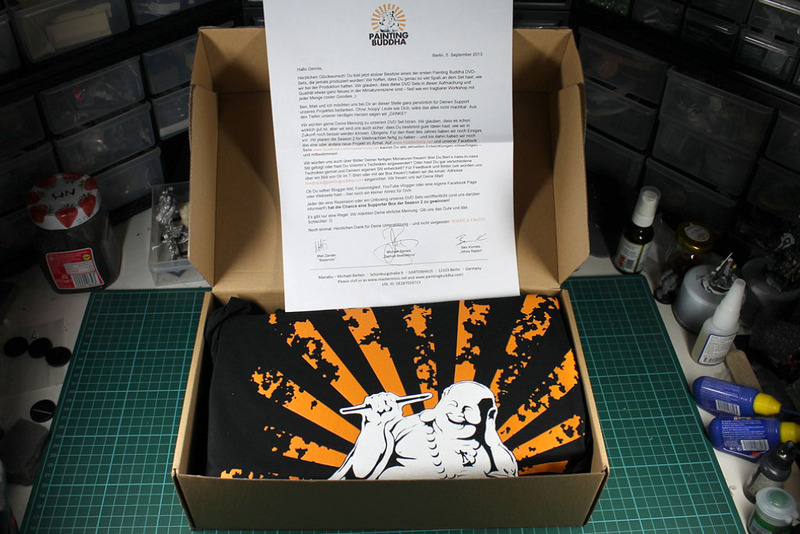 and rounds the big package off in a proper manner. But beside the huge amount of information and hints you get, all three have a clear message for you. Practise! Practise! Practise! to really absorb the learned content. 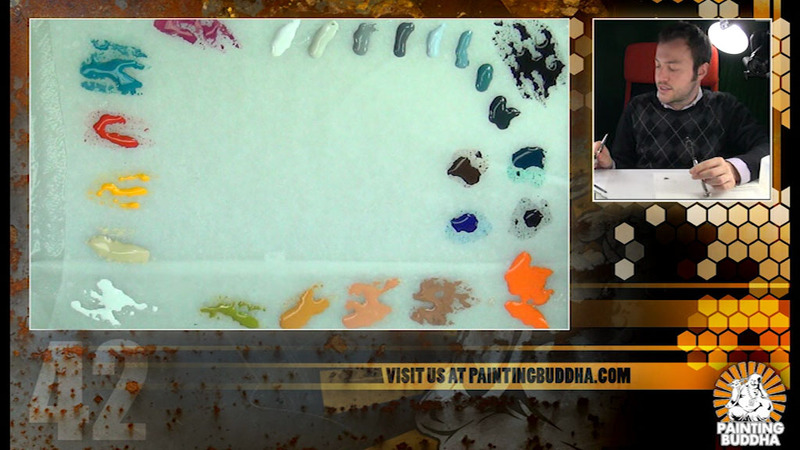 Last but not least, you get a calm smile from the painting buddha with the last frames of the DVD. Wow, a clear and simple wow. 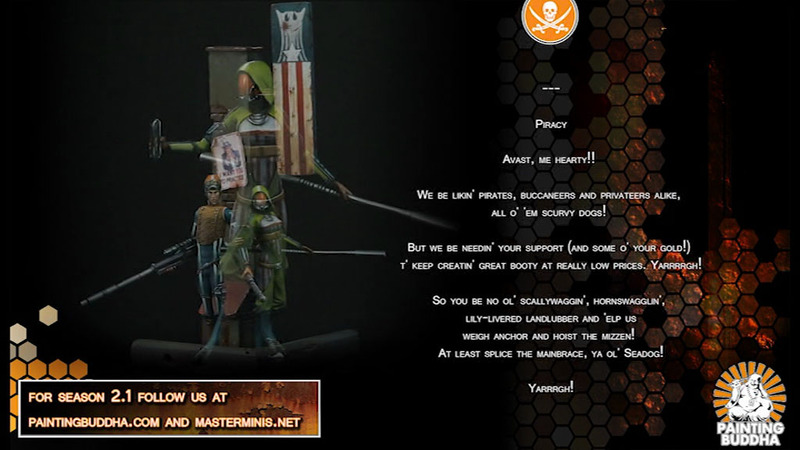 Those of you, who know Michael, know about his passion about the wargaming hobby. 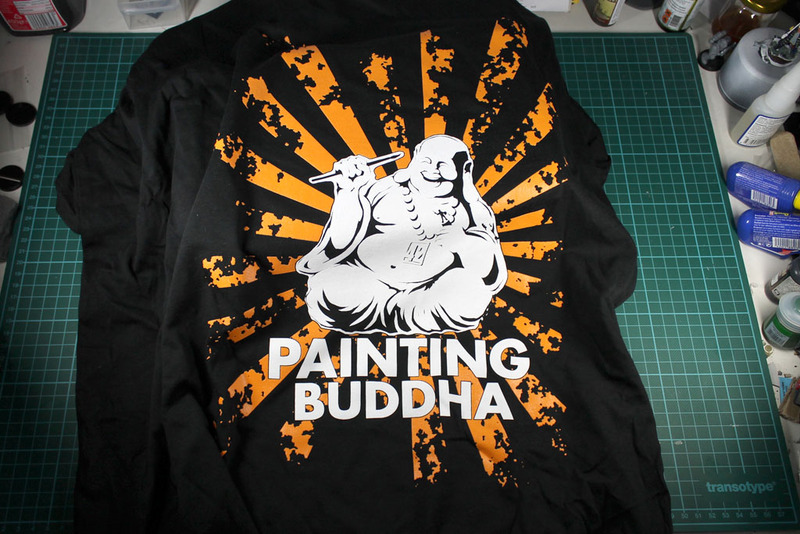 And exactly this passion, this enthusiasm, is something that you can feel with the Painting Buddha project, in every detail and on every part. 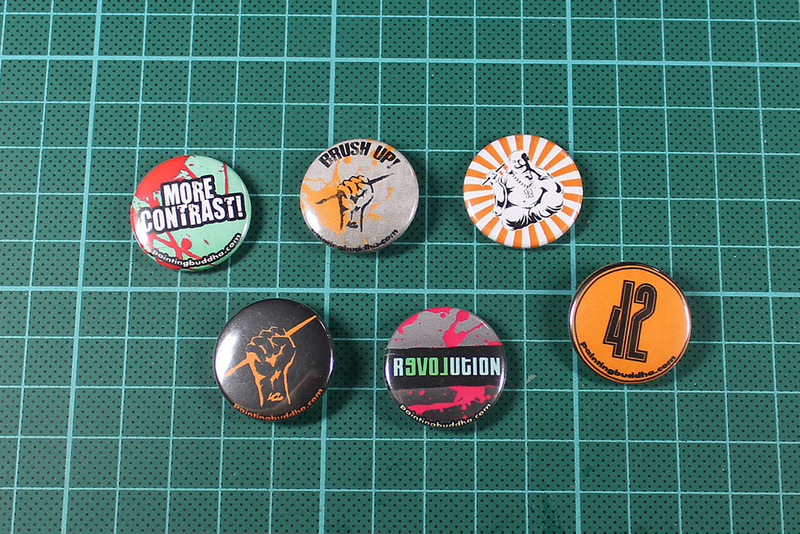 Beginning with the crazy details, like the 42 and multiples of it thorough the whole project, the size of the stickers, the price and a lot more secret hints, that probably slipt by me. 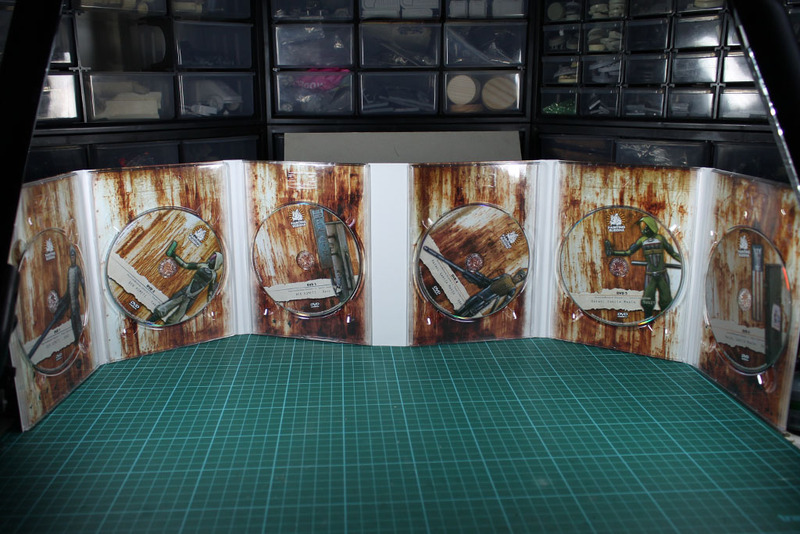 The running time of the dvd is impressive, as well as the idea, to have a double take with two painters on the topic / tutorial. 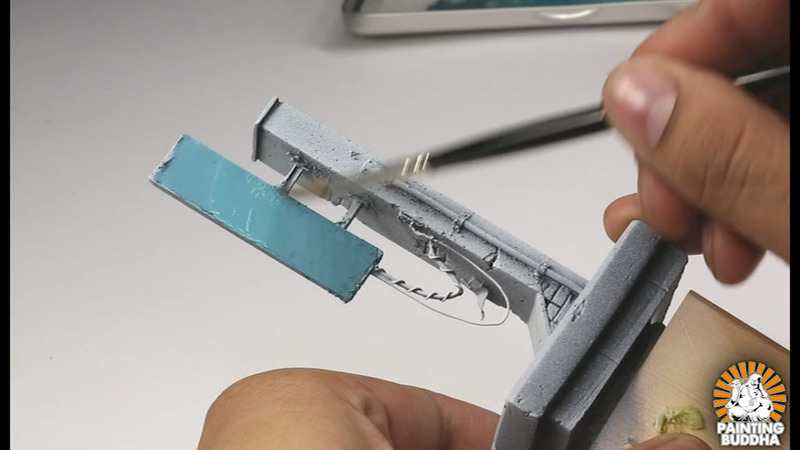 By this you get more views and techniques, combined in one single box. This makes the Vol. 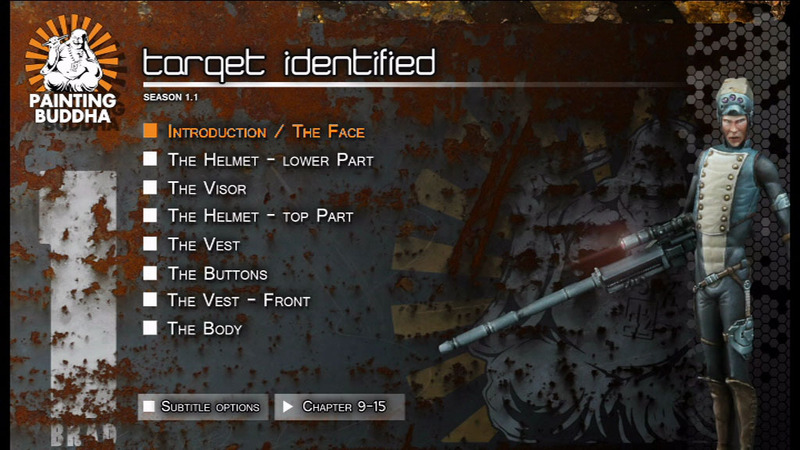 1.1, Target Identified, incredibly interesting. You aren't shown one way, but two. 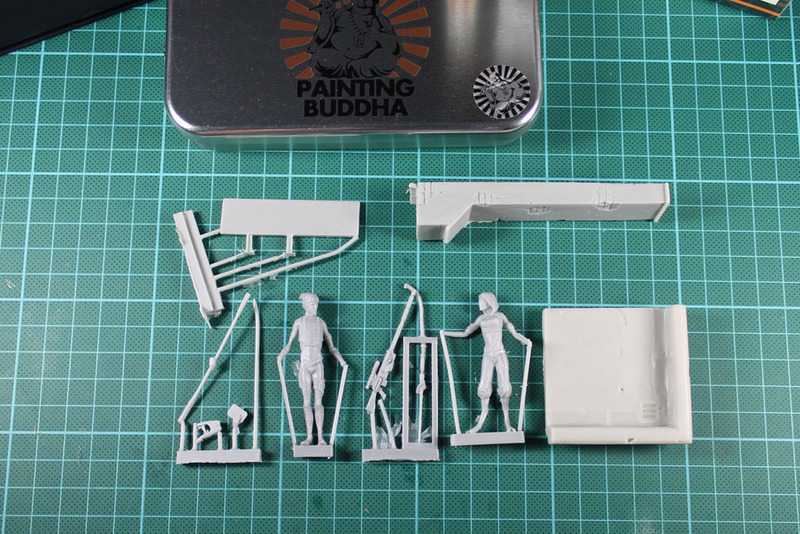 Add the several miniatures, and in the end, you receive even more. This widens the information for the viewer in a more intense way, as you don't just copy their way of painting, you explore the possibilities. 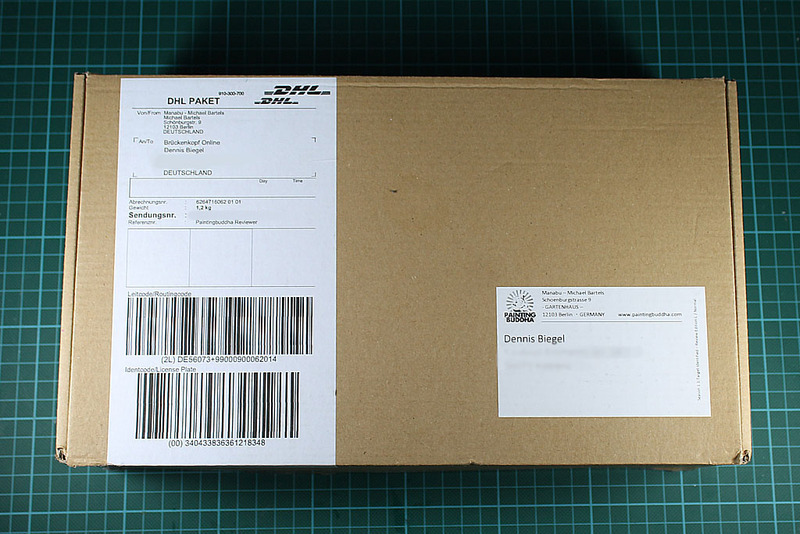 All this, with the goodies like pins and stickers, including the miniatures, is an incredibly big package for 42 Euro. 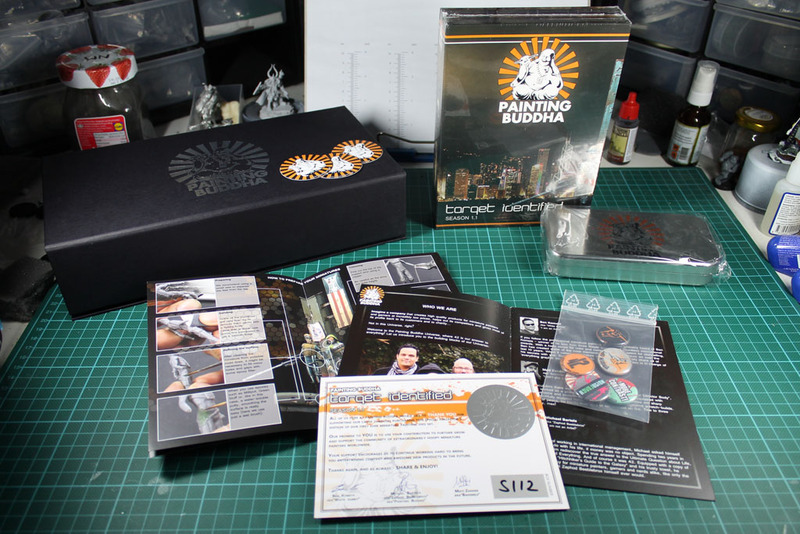 You get a whole set of six DVDs and two 54mm figurines along with a base, which is high value for money. Still hesitating? There is no reason for that. Clear recommendation to buy.